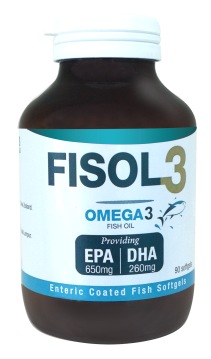 FISOL3 Triple Strength Fish Oil | 3x More than Regular Double Strength Fish Oil - More EPA inside, Faster Results in Lesser Softgels! What Makes FISOL3 Fish Oil So Good? Trusted by Professionals. Preferred by Consumers. 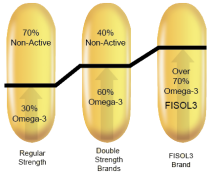 FISOL 3 Triple Strength Fish Oil is highly concentrated with more than 70% omega-3 fatty acids. Compare this to regular strength 30-35% concentrated, and even double strength 60%, you can see how it would take many more capsules daily to equal the amount of omega-3 fatty acids found in one serving of FISOL 3 fish oil. Let’s find out the mechanism of Omega works and the benefits it bring to improve in our healthier heart, joints condition and our mood. Why EPA is Important ? Let’s find out more than a dozen successful trial show high intensity of the EPA ingredients in fish oil could helps in our body. How Safe it is ? Let’s find out how 3x strength fish oil was recognized by worldwide professionals and preferred by patients. We are happy to consult you on purchasing the right fish oil.